Sandwiches are a lifesaver. They’re usually quick and easy, customizable, and can be as simple as a PB&J or as complicated as the Elvis. It’s an easy portion-controlled size that can easily satisfy a hunger for a little while and even fun to lunch swap with friends! 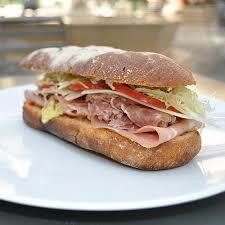 But sometimes, a fancy sandwich is needed as a treat or a break from the kitchen without taking half an hour to cook. I introduce to you: prosciutto and fig sandwich. The idea was accidental. A friend of mine sandwiched two small appetizers into one big bite, the crunchy bread of a bruschetta with a prosciutto-wrapped carrot. However, I’m sure this recipe is tastier. With a little bit of cooking, it’s just as sweet and savory, yet filling. You can save the rest in a container in the fridge for about a week. Great for salads! Start with making the reduction. In a small saucepan, pour the ½ cup of balsamic over high heat. Whisk briskly. Once it starts to boil, constantly whisk to prevent burning. Cook for 5 to 10 minutes, or until the liquid becomes a syrupy consistency. Drizzle oil on both slices of bread and toast until golden brown. This works best in a toaster oven for 3 minutes, but a toaster works as well. Spread or top the goat cheese on the bottom, then the prosciutto slices on the bread. Drizzle a teaspoon of the reduction onto the meat. Next, add the greens with another drizzle of the balsamic reduction. Spread the fig jam or marmalade on the top slice, season with freshly ground black pepper, and add the top bun to finish. Although it is a sandwich, it’s quite tasty and feels a little fancy, almost like a classy cafe with jazz music dancing across the room. For more incredible recipes, check out the Fill Your Plate recipe section. This entry was posted in Arizona, Cooking, Fill Your Plate, Food, Health Tips, Healthy Eating, Produce, Recipes and tagged Fig, food, New, Prosciutto, Recipe, Sandwich, Yum. Bookmark the permalink.